Predominantly white poster with black lettering. Title at top of poster, with one phrase on either side of the image. Visual image is a b&w photo reproduction featuring a woman and two young boys. The woman is kneeling down so she is about the same height as the boys. Caption to right of photo addresses the woman’s insistance on avoiding the risk of HIV/AIDS while dating. Note below caption, publisher information below note. Un mensaja al tercer hombre en mi vida. Escucha. Soy una madre soltera con dos niños, y los quiero mucho. Si, me gusta salir con homres, pero quiero decirte que estoy tomando precauciones contra al SIDA. 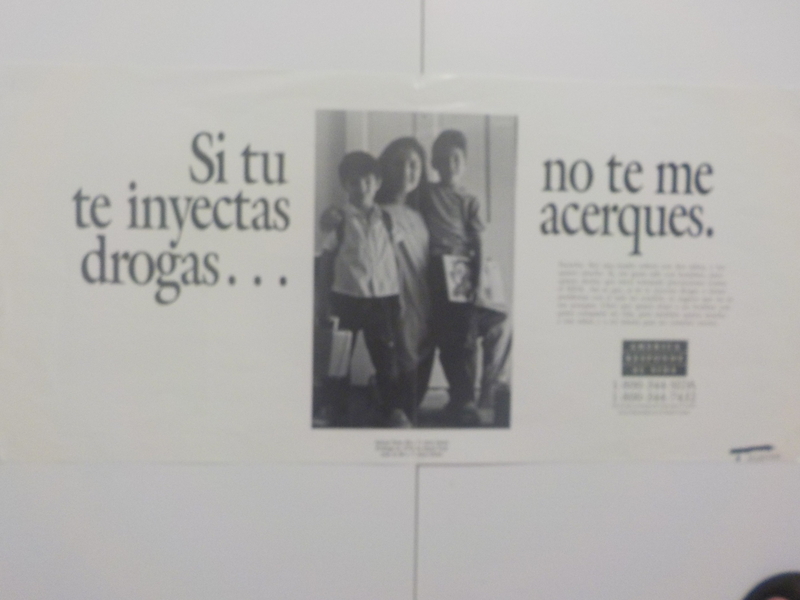 Así es que , si tú te inyectas drogas o tienes problemas con el usar un condòn, te sugiero que no te me acerques. Claro que quiero tener a un hombre con quién compartir mi vida, pero también quiero mucho a mis niños y a mi misma para no cometer errorres. Este ha sido un mensaje del Centro para el Control de las Enfermedades de los Estados Unidos. Issued between 1988 (when the America responds to AIDS campaign began) and 1993 (when Centers for Disease Control changed its name to Centers for Disease Control and Prevention). Centers for Disease Control and Prevention (U.S.). François-Xavier Bagnoud Center.. University of California, San Francisco. Center for AIDS Prevention Studies..